We’d love your help. Let us know what’s wrong with this preview of Jet Plane by David Macaulay. To ask other readers questions about Jet Plane, please sign up. I think the topic is what makes this book unique. Most informational books for kids are about animals or interesting places. Not many people would consider how a jet engine works to be a topic for children to read about. I love David Macaulay's books. They always amaze me with the way he can break complex things down into their components and make them understandable. His book, The Way Things Work, is a favorite in our library. So when I discovered David Macaulay's My Readers books, I was extremely pleased. They are just 32 pages long, but still filled with all his intricately labeled and diagrammed illustrations and compelling explanations of different nonfiction topics. To help with learning more about each to I love David Macaulay's books. They always amaze me with the way he can break complex things down into their components and make them understandable. His book, The Way Things Work, is a favorite in our library. So when I discovered David Macaulay's My Readers books, I was extremely pleased. They are just 32 pages long, but still filled with all his intricately labeled and diagrammed illustrations and compelling explanations of different nonfiction topics. To help with learning more about each topic, the books have a glossary, an index, and a list of suggested books and other media to explore. 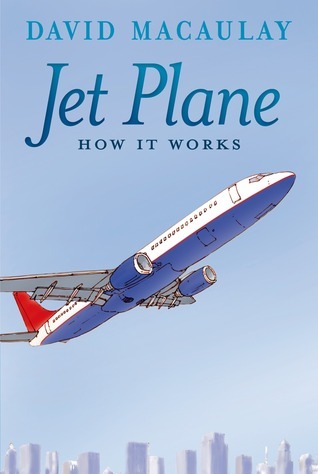 Since I love planes and flying, I read Jet Plane: How It Works and thought about how much my fellow aerospace educator buddies would love to have copies of this book to use with their students. How in the world does he fit so much into such a small book? There are diagrams of how planes pull away from the terminal and the interior of a jet engine; explanations of lift, thrust, and how to steer a plane; and the glossary is built around a diagram of the plane with all the parts nicely labeled. There is much more than that, but you need to see it for yourself. As always, David MaCaulay manages to take big ideas like lift, thrust, combustion chamber, and break it into its components, so that even a 7-year old can feel like an expert on a subject. MaCaulay’s illustrations are superb and the diagrams contribute to understanding. The diagram that shows how throttle is connected to fuel tank that sends extra fuel to engines finally allowed me to see the process that I only imagined in my head. Detailed illustrations accompanied by interesting text that provides children with a great amount of "jet" vocabulary. A "My Readers" book with easier reading than you come to expect with MacAaulay's books. Wonderfully written, in simple, informal, speaking to the reader language! Great illustrations with simple diagrams. My kids age 7 & 3 both really enjoyed. Will read others by this author!